A $150,000 pre-trial settlement has been reached in the case of a disabled woman who was injured in a King County Metro bus accident in 2016. In July of that year the plaintiff, who uses a walker, was riding Metro Transit bus (Bus Route No. 2) in Seattle near Third Avenue and Union Street. When she boarded the bus the disability seating was occupied by non-disabled riders. The driver did not make any effort to remove non-disabled passengers from the seats reserved for disabled passengers. 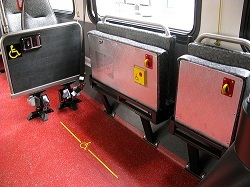 The disabled woman was thus forced to stand while the bus started to move and during transport. She attempted to balance herself while the bus continued its route. But the driver made a sharp left turn that caused her to lose her balance and fall. The bus driver breached his duty of care by failing to accommodate the woman’s disability and failing to unseat non-disabled passengers occupying the disabled seats which is a direct violation of 49CFR 37.167, and other applicable statutes, regulations, policies and procedures. She was taken via ambulance to the emergency room at Harborview Medical Center to treat a deep contusion on her right leg as well as neck, shoulder, arm and jaw pain. Her injuries eventually required extensive medical treatment including two separate surgeries. The day after the accident she contacted King County Metro Transit risk management and was asked to go on the internet to fill out a claim form. She does not have internet access. Metro would not open the claim over the phone but instead mailed a claim form to her. As a result the woman suffered injuries, emotional trauma, and medical expenses. Metro disputed that the driver had any responsibility to assist handicapped / disabled riders. So the accident victim retained the bus accident attorneys at Davis Law Group to represent her. The lawsuit Ballard v. King County (17 2 21597 0 SEA) was filed on 8/16/2017 in King County Superior Court and had been scheduled for trial in December of 2018. However Davis Law Group as able to settle the case before trial for $150,000.